Pegasus Saddles (http://www.PegasusSaddles.com) has changed the way a horse can move with its new Pegasus Butterfly and Pegasus Unicorn technologies. With a unique, hinged, self-adjusting tree, technology has entered the staid and traditional saddle making industry. Its unique hinged tree allows a Pegasus Butterfly Saddle to automatically adjust to fit every horse in the barn – no matter if it is a wide draft horse or a slender race horse, simultaneously increasing the horse’s comfort therefore dramatically improving performance. In an era of iPhones, it was only a matter of time until modern science impacted the equestrian saddle industry. 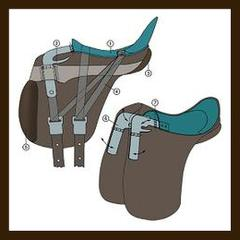 While a variety of up-to-date materials are incorporated into modern saddles, a saddle maker from George Washington’s time would have no trouble fitting into a modern saddle factory. However, horses, like people, come in all shapes and sizes. Properly fitting each horse and rider combination has been part art form, part science. Adjustable saddles have been tried in the past, but none were truly practicable until now, with the introduction of Butterfly and Unicorn technology from Pegasus Saddles. Pegasus Saddles has radically changed and improved upon centuries old practice. Inserting two pairs of torsion hinges into the frame of the saddle (called the tree) creates saddles that automatically adjust to fit the horse – no matter if it is a wide draft horse or a slender race horse. One set of hinges adjusts to the width of the horse’s body, the other adjusts to the angle of the horses’ shoulder. The benefits of this technology are significant. This saddle tree makes it possible to ride almost every horse using the same saddle. The system’s technology compensates for the different shape of each horse. These hinges also improve the horses comfort, and therefore performance as they allow the tree to adjust exactly the right amount with each step, opening in the appropriate direction to give the horse’s muscles room to flex. Always allowing exactly the right amount of extra room, the system lets the horse move more fluidly and jump higher. Pegasus Unicorn and Pegasus Butterfly technology has only 4 moving parts, all protected deep inside the saddle tree. There is nothing to break or go wrong with this new technology, and the perfect fit to horses’ bodies and precise movement of the hinges allows the horse to move, jump, and elevate more freely… as if you gave your horse wings.